RUTFs are a “homogeneous mixture of lipid-rich and water-soluble foods.” The lipids used in formulating RUTFs are in a viscous liquid form. The other ingredients are in small particles and are mixed through the lipid. These are proteins, carbohydrates, vitamins and minerals. The mixture needs to be homogeneous for it to be effectively consumed. To do this, a specific mixing process is needed. The fat/lipid component of the RUTF is heated and stirred first. The heat should be maintained for the lipid to remain in the optimum form for mixing in the other ingredients. The powdered proteins, carbohydrates, and vitamins and minerals are then slowly and gradually added to the lipid, while the lipid is being vigorously stirred. After all the ingredients are added and vigorous stirring is maintained, the mixture is then stirred with more speed and for several minutes. If the powdered ingredients have a particle size that is larger than 200 µm, the mixture starts to separate; the particle size needs to be maintained at less than 200 µm. Ready-to-use therapeutic food (RUTF) are energy-dense, micronutrient enhanced pastes used in therapeutic feeding. These soft foods are a homogenous mix of lipid rich foods, with a nutritional profile similar to the World Health Organization-recommended therapeutic milk formula used for inpatient therapeutic feeding programmes. Typical primary ingredients for RUTF include peanuts, oil, sugar, milk powder and vitamin and mineral supplements. The standard dose of RUTF is adjusted according to the weight of the child under treatment. It can be consumed in the home at any time under minimal supervision until the child has gained adequate weight. Because RUTF do not contain water, children should also be offered safe drinking water to consume at will. They also require a short course of basic oral medication to treat any infections and for deworming, vitamin A supplementation and folic acid. Health workers should also provide follow up care in the form of the next supply of RUTF on a weekly or biweekly basis, and should monitor the child’s condition. An average full course of treatment for a child amounts to around 10-15 kilogrammes of RUTF over a 6-8 week period, which is approximately one carton of RUTF (150 sachets). UNICEF is the world’s largest purchaser and distributor of RUTF. Other notable procurers include Médecins sans Frontières and the Clinton Foundation. Around 1.96 million children suffering from SAM were treated with RUTF in 2011, accounting for around 10 per cent of the estimated 20 million suffering from severe acute malnutrition globally. In Indian diets the most commonly used pulses are in the form of ‘dal’ which means ‘split pulses’ ,these are stored in dried and uncooked form. While cooking these are either cooked in pressure cooker or in pans along with water and are consumed as thin or thick liquid form along with rice or Indian bread (roti). These pulses form an integral part of staple food all over India especially as a source of proteins for vegetarian population which is predominant in India as compared to those who have access to animal protein. The whole pulses are also used in soaking, sprouting and then using them to make a curry called ‘usal’ which is cooked with spices and salt and are normally eaten along with rice or Indian bread (roti). The pulses flour like Bengal Gram flour is used for making several kinds of Indian sweets like jalebis, laddoos etc. which are nutritious as well as delicious. RUTF normally uses peanut powder, milk powder, powdered sugar, vitamin and mineral premix as ingredients which are emulsified in vegetable oil phase and are mixed to form a paste. Instead of paste form we propose using dry powder of mixed pulses, sugar and dry vitamins and minerals which is packed in a sachet form. At the time of administration this powder is added to a bowl containing fortified soya milk, by simple stirring with a spoon by which the powder is dissolved into soya milk for making the required paste form. 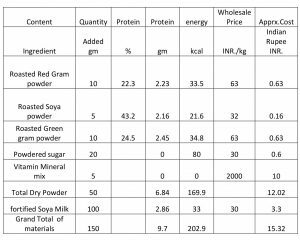 The net weight will be around 150 gram of RUTF (100 gm soya milk contains 2.86 gm protein, 1.61 gm fat, 33 kcal, 1.74 gm carbohydrate). 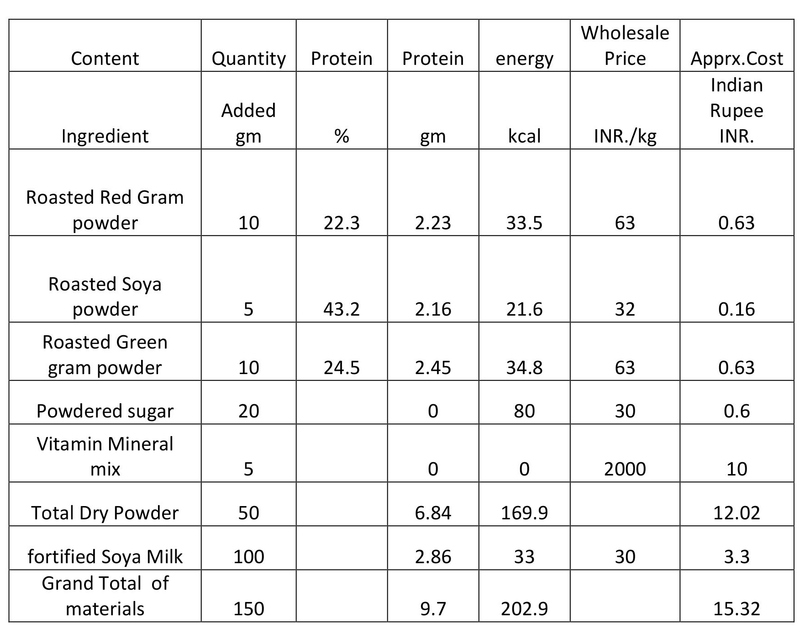 Therefore our total material cost comes to about Rs.15.3 + labour cost of Rs.0.7= Total cost Rs.16 per serving of RUTF to provide 203 kcal energy, 9.7 gm protein. This cost is much lower than the commercially available RUTF (either imported or commercially produced) which costs Rs.24-25 per serving and it is also not being used at a large scale for the treatment of SAM. In India, 48% of children under- five years of age are stunted and 43% are underweight: almost 8 million children suffer from SAM. It is argued that though the effectiveness of Plumpy Nut (produced by Nutriset in France and being imported in several States for SAM treatment in India), has been demonstrated in other countries, the studies demonstrating effectiveness were carried out in disaster settings where other community-based treatments for SAM have not existed. Many locally produced/producible foods that are culturally acceptable and relatively low cost have been used for SAM in India for many decades by reliable academic and medical institutions as well as by non-governmental groups. Though there are few formal studies documenting their efficacy, there are some along with plenty of anecdotal evidence of success. It could be therefore concluded that the locally produced RUTF substitute like the one produced by our NGO could be an effective, economical and sustainable option to be scaled up at various sites. We propose setting up such small manufacturing units in the areas where there are more number of cases of SAM in India. This will minimize the logistics cost of importing large quantities and storage at central warehouses. Our NGO supports the Government programmes in various states in setting up such units. All the materials including vitamin and mineral premix are available and locally produced in India. Our process requires only a small blender and a sachet packing machine as well as soya milk bottling or sachet making machine which does not require high investments and this also generates employment to the village and community level.